Everyday more and more companies are implementing internal and external digital signage at their establishment to showcase marketing offers, sales products and informational content with the intent of increasing revenue and patronage. Today we want to educate you about outdoor digital signage, how it is used, and key factors that should be taken into consideration when securing it for your business. Outdoor digital signage can be displayed in almost any outdoor environment; including the side of a bus shelter, fast-food restaurants, schools and universities, casinos, shopping malls, and transportation terminals, just to name a few. 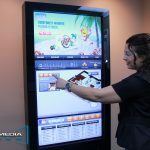 Outdoor digital signage is used to quickly capture your target audience while cross-promoting your business and showcasing your unique selling points. When thinking about implementing digital signage, there are seven key factors that you must be aware of. Does it mean that if it is too hot or too cold you can’t use digital signage displays? Not at all. Outdoor digital signage can withstand -20 degrees to 110 degrees Fahrenheit. Sometimes more or less depending on the quality of hardware you purchase. However there are cooling solutions that help digital signs take more extreme temperatures. Thus allowing places like Southern Nevada, Arizona and other parts of the country to have such trend-setting outdoor digital signage. Let’s talk about another factor that is very important, Visibility! How viewable is your content outdoors? Have you ever used your laptop or smartphone outside and had difficulties trying to see what is being displayed on the screen? Well, the same happens when you display digital signage. If your environment is too bright, it could become difficult for a person to tell what is being displayed, and then your advertisement is no longer appealing. However there are ways to overcome that based on placement, LED technology and other quality factors. All of the seven factors mentioned above are important factors in determining the quality sign that you need. If you address all factors your display should last you for the duration of your business, or at least the technology life span. With all of this in mind, it is very beneficial for you to work with a company that offers you the best product, for your unique setting, and for the most economical investment. 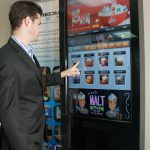 For more information about outdoor digital signage and Intermedia Touch, feel free to give us a call. We would like to give you the best outdoor digital signage solution.